From left to right are Gallia Local Schools Superintendent Jude Meyers, River Valley High School teacher and Yale Educator 2018 awardee Aaron Walker and River Valley High School Principal T.R. Edwards. 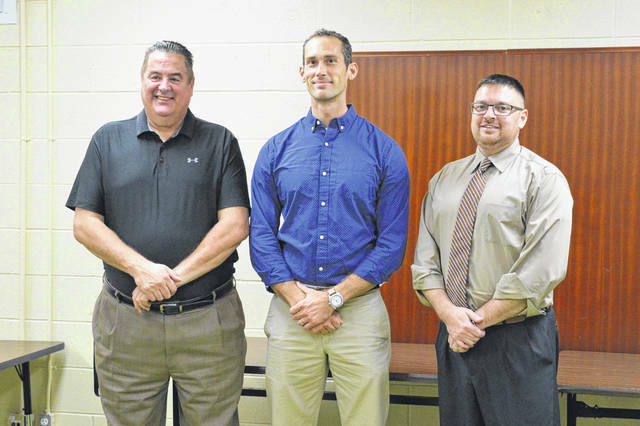 BIDWELL — Gallia Local Schools Board of Education, Monday evening, recognized River Valley High School teacher Aaron Walker for recently receiving the 2018 Yale Educator Award. The letter further goes on to state that Yale’s incoming Class of 2022 students were asked to nominate an outstanding educator who impacted his or her life. Sharla Moody, an RVHS alumna of the Class of 2018, entered Yale University as a student this fall and nominated Walker for the award. “As our committee reviewed nominations, we were constantly reminded of the unique and critical role that exceptional educators play in shaping their students’ futures by encouraging them to pursue their goals,” wrote Yi and Dunn. “We’re pretty excited for Aaron for this prestigious honor,” said Gallia Local Schools Superintendent Jude Meyers.